With each passing day, prices are dropping at Midsouth Shooters Supply. Right now Midsouth is running its end-of-year Inventory Closeout Count-Down. This is a very unique sale — now through December 31st the price on Midsouth’s clearance items drops 5% each successive day. So the deals get sweeter and sweeter. But, inventories are limited — if you wait too long you may be out of luck. 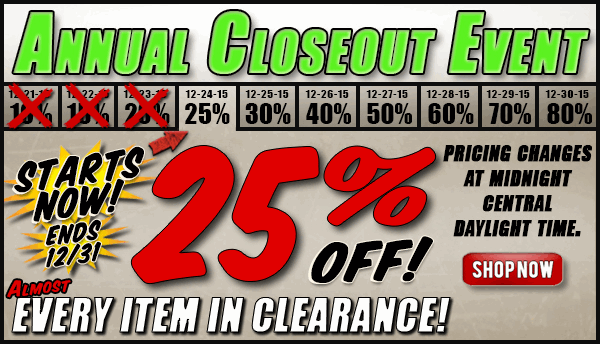 Today, four days into the sale, every item on clearance is 25% off. That’s pretty tempting. Remember — the number of clearance items offered is strictly limited. If you see something you like you can watch the price drop 5% each day. But if you procrastinate, the item may get sold. As Midsouth says: “Wait too long and it may be gone”. CLICK HERE for SALE. Share the post "Awesome Deals at Midsouth — Getting Better by the Day"
What could be more fun than decorating a Christmas tree? Well how about busting Xmas ornaments with a .50 BMG. Boys will be boys, right? This 50 Cal Days of Christmas video features some fantastic slow-motion footage of a Barrett .50 Caliber M82. This bad boy pumps out some serious muzzle flash. Watch carefully at the 1:05 mark and you can see the .50-caliber projectile exit the muzzle brake and spin through the ball of smoke and flame. Share the post "Crazy Days of Christmas — Having Fun with a .50 BMG"